Over 1,100 visitors attended Wittmann Battenfeld’s Competence Days from April 24-25 in Kottingbrunn, Austria, according to its announcement. Its new assembly hall for large machines was also officially opened during the event. First of all, speeches were given related to latest injection molding and processing technologies. The introductory speech in this series was held by Prof Dr Ansgar Jaeger, Professor of Injection Molding and Mold Technology at the Wurzburg University of Applied Science, on “Megatrends reflected in injection molding technology”. This was followed by another guest speaker, Helmut Kohake, Managing Director of Müller Technik, talking about process combinations. One highlight among the machine demonstrations was the presentation of the first MacroPower E Hybrid large machine model, consisting of a modern, servo-hydraulic two-platen clamping unit combined with an all-electric high performance injection unit. 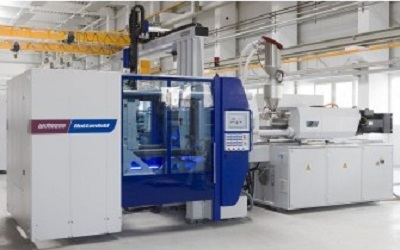 Wittmann says this combination enables the design of a large, compact machine with a minimal footprint, which simultaneously offers maximum precision and energy efficiency together with high injection speeds. On the MacroPower E Hybrid, the production of a B column for the automotive industry was demonstrated. Other highlights were a MicroPower 15 with an LSR equipment package, on which a medical technology application was demonstrated, the presentation of the IMIW (In-Mold Internal Welding) process on an EcoPower 110 with a mold supplied by Barkley, UK, and an EcoPower Xpress 180 with IML and high-speed parts removal. IML technology was also presented on an EcoPower 180 producing credit cards from a biodegradable material, which has been developed by IFA-Tulln, Austria. CELLMOULD structured foam technology was shown by manufacturing pallets on a MacroPower 800 with a mold supplied by Haidlmair.The production of a hockey stick, also with a mold from Haidlmair, was seen on a hydraulic machine from the HM series, an HM 300 with ServoPower technology, using the AIRMOULD gas injection process. BFMOLD variothermic technology was demonstrated on an HM 110 with insider solution, and multi-component technology. Playmobil figures were injection-molded from 3 different components on an HM 65.The machinery program was rounded off by a high-speed TM Xpress and a VM 110 rotary table machine with an automation cell for parts insertion and parts removal.